Wednesday is offering even more new ideas and nutrition and hydration themed events! We just love the ideas that are coming from every area. With the theme of ‘Global Afternoon Tea’ there are lots of tea parties and some with themes! Lister 1 are having a Mad Hatters Tea Party while E39 are having a round the world tea party. It is world food day on Loxley. MUST is featuring on many wards including Toghill, CICU and D55, and D10 are featuring MUST in their ‘Weight Wednesday’. 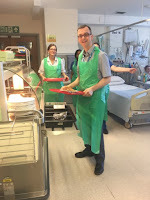 On D33 staff are doing meal time observations, and we have 12 dining companions out and about today. 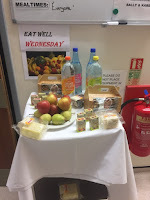 Eat well Wednesday on AICU and Critical care, including fruity snack stations. The Burns unit are having Water Wednesday, while C30 and D8 Staff are completing food and fluid charts to see what their intake is like. And to treat yourself, please don’t forget Elior are still doing their promotional offers and give away! Tomorrow, don’t forget that there’s a food tasting, Nutricia stand, free bottles of water, raffle and scones on D Floor, restaurant, QMC.